Follow this topic on Facebook! The V2 rocket was a short-range rocket or ballistic missile developed by the Nazi regime during World War 2 in Germany. The German name for the rocket is: Vergeltungswaffe 2, translating to retaliation weapon 2 which also had the more technical name of the Aggregat-4 (A4). The missile used liquid propellant and was the first long-range missile developed to strike at both London and Antwerp during the war. 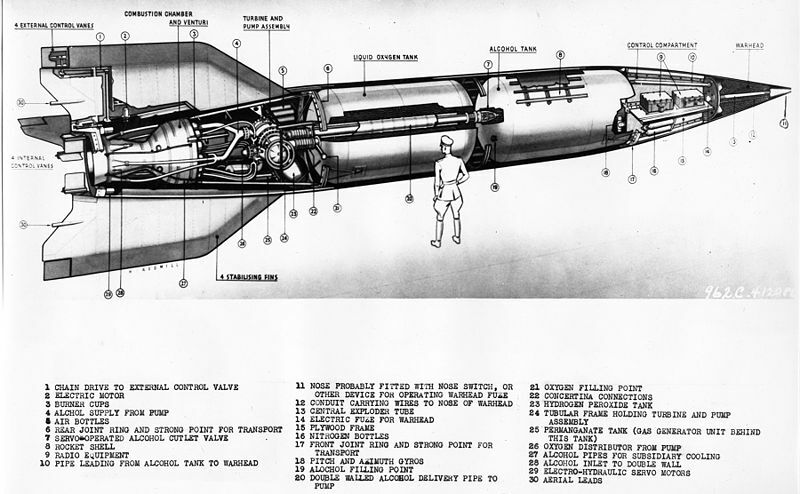 The V2 rocket was also thought to be the first known human created artifact or structure to enter space. After World War 2, the U.K, Soviet, and American governments would obtain access to the V2 rocket designs as well as various German scientists who worked on the project through Operation Backfire, Operation Osoaviakhim, and Operation Paperclip. The V2 rocket was heavily leveraged by Nazi propaganda efforts as a “more severe” retaliation for the bombing of German cities by the Allies from 1942 until the end of World War 2. The rockets would start to be launched in greater numbers starting in September 1944 (more than 3,000) against various Allied targets by the German Wehrmacht to include Liege, London, and Antwerp. 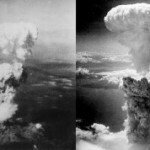 Although difficult to calculate the exact number of casualties attributed to V-2 rocket attacks, it is thought that at least 9,000 civilians and military personnel were killed by the rocket attacks with more than 12,000 concentration camp and forced labor persons deaths attributed to the production of the missiles. 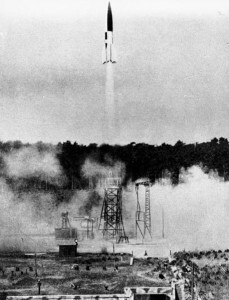 A V-2 launched from a fixed site in summer 1943. Flight altitude: 88 km (55 mi) maximum altitude on long range trajectory, 206 km (128 mi) maximum altitude if launched vertically. Ruined flats in Limehouse, East London. Hughes Mansions, Vallance Road, following the explosion of the last German V2 rocket to fall on London, 27 March 1945. The origins of the V-2 rocket go back to the late 1920’s when Wernher von Braun read the Hermann Oberth book, Die Rakete zu den Planetenräumen (The Rocket into Interplanetary Space). Von Braun would start attending the Technical University of Berlin in 1930 where he would assist Oberth in testing on liquid-fueled rocket motors. He was deep into working on his doctorate as the Nazi Party came into power in Germany, when a German artillery captain, Walter Dornberger, provided an Ordnance Department research grant to von Braun. 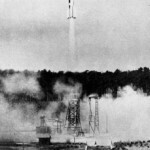 From that point forward he would work alongside the existing Dornberger solid-fuel rocket test site located at Kummersdorf. Von Braun’s final thesis, “Construction, Theoretical, and Experimental Solution to the Problem of the Liquid Propellant Rocket” (dated 16 April 1934)” was kept classified by the German army, but was ultimately published in 1960. His work would result in the successful launches of two rockets which reached altitudes in excess of 2 and 3 kilometers by the end of 1934. A rusty V2 rocket engine in the underground production facilities of the Nazi concentration camp Dora-Mittelbau (Nordhausen, Thuringia, Germany). V1′s and V2′s were produced here from january 1944 by camp inmates in enormous tunnel systems with a total length of some 20 km. Throughout this time, Germany would approach American physicist, Robert H. Goddard, with technical questions related to his research (prior to 1939). Von Braun would leverage Goddard’s published research and incorporate his ideas into the building of the Aggregat (A) series of rockets / missiles. From these research successes, Von Braun and Walter Riedel started to design a much larger rocket based on a significantly larger 25 ton thrust engine. Work would continue until late 1941 when the four key technologies for a successful rocket where developed: liquid-fuel rocket engines, supersonic aerodynamics, gyroscopic guidance and rudders in jet control. By September of 1943, von Braun promised the Long-Range Bombardment Commission that his A-4 development was practically complete. The work had progressed enough, and Hitler was in need of a dramatic weapon to unfold, that he authorized production of the V-2 in large numbers. The V2 rockets would be made at the Mittelwerk site by prisoners from the Mittelbau-Dora concentration camp and other forced laborers. The A-4 rocket (V-2) used a 75% ethanol / water mixture for the jet fuel and a liquid oxygen (LOX for short) for the fuel oxidizer. When the rocket was launched, it would power itself for up to 65 seconds. The program motor when then control the pitch of the rocket to a specified angle when the engine shutdown. At this point, the rocket would continue on a ballistic, free-fall trajectory. The V2 would reach a height of 80 km after the engine was shut off. The V2 rockets fuel and oxidizer pumps were steam turbines which was produced through the use of concentrated hydrogen peroxide and a sodium permanganate catalyst. The alcohol and oxygen tanks used an aluminum-magnesium alloy. The combustion burner of the rocket reached temperatures ranging from 2500–2700 °C (4500 – 4900 °F). During operation, the alcohol-water fuel mix would be pumped along the double-wall of the main combustion burner. This would heat the fuel and cool the chamber. At this point, the fuel would be sent to the main burner chamber through more than 1,200 nozzles (specifically 1,224) that would ensure the correct mixture of alcohol and oxygen was being used at all times. There were also small holes in the structure that allowed some of the alcohol to escape directly into the combustion chamber of the rocket. This would help form a cooling boundary layer that would help further protect the wall of the chamber. During operation, the boundary layer of alcohol would ignite when it came into contact with the atmosphere. The V2 rocket used four external rudders on the tin fails of the missile along with four internal vanes (graphite construction) located at the exit of the rocket motor. The missile also used the LEV-3 guidance system that included two free gyroscopes (a horizontal and vertical one) to help stabilize the rocket. The V2 also used a PIGA accelerometer to cutoff the engine at a pre-specified velocity. Since the V-2 was launched from a location that was pre-surveyed, the distance and azimuth to the target location were already known. This would allow the Fin 1 on the missile to be aligned to the target azimuth. V2’s used later in the war would make use of guidance beams sent via radio transmission from the ground to keep the rocket on course. The early models of the rocket made use of an analog computer that would adjust the azimuth for the rocket via engine cut-off, would be ground controlled through a Doppler system, or via different variants of on-bard integrated accelerometers. The initial production line for the V-2 rocket was located at Peenemünde; however, after Operation Hydra resulted in the location being attacked, production was moved to Mittelwerk in the Kohnstein. Once Adolf Hitler’s declaration on August 29th, 1944 to begin conducting V-2 attacks as soon as possible, the Germans started their V-2 offensive on September 8th, 1944 with a single launch against Paris. The attack resulted in moderate damage located near the Porte d’Italie. Two additional launches would occur on the same day against London. The Germans would announce the rocket attacks on November 8th, 1944, and Winston Churchill would inform parliament and the rest of the world on November 10th, 1944 that England had been under rocket attack for the last several weeks. During the period leading up to November 1944, the locations of the German launch units would change a number of times. 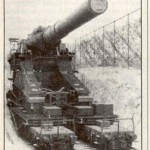 In southwest Netherlands, the Artillerie unit 444 would launch approximately five V-2’s on September 15th and 16th. The unit would move to Gaasterland where additional rockets were launched against Ipswich and Norwich, England on September 25th, 1944. Due to the inaccuracy of the V-2, these launches were not able to hit their target cities. Hitler would then decree that only London and Antwerp would remain as designated targets (Antwerp specifically from October 12th-20th, 1944). The V-2 rocket (German: Vergeltungswaffe 2) was the first ballistic missile and first man-made object to achieve sub-orbital spaceflight, the progenitor of all modern rockets including the Saturn V moon rocket. Over 3,000 V-2s were launched as military rockets by the German Wehrmacht against Allied targets in World War II, resulting in the death of an estimated 7,250 military personnel and civilians. One of the main targets was the port of Antwerp, counting 1300 hits. The most infamous hit was the destruction of cinema Rex in the heart of the town killing nearly all spectators in the near sold out theatre. 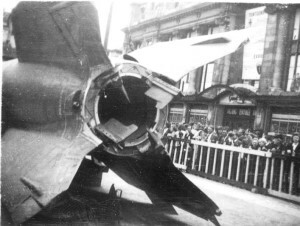 This V-2 is exhibited on the Groenplaats in Antwerp (1945). You can clearly see the exhaust with directional vanes. The photo was taken by my grandfather Jan B.H.A. Vervloedt (1945) and is now in the family archives. It’s now estimated that approximately 2,754 civilians were killed in London during World War 2 by the Nazi V-2 attacks and 6,523 were injured. 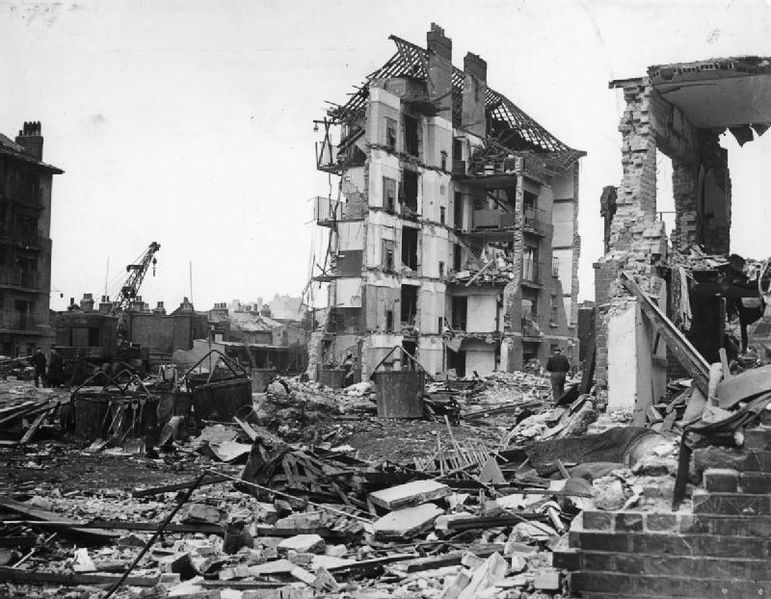 Over the course of the war, the accuracy of the missile increased to the point that 160 were killed and 108 injured during a V-2 attack on November 25th, 1944 in New Cross, south-east London when the rocket hit a Woolworth’s department store. A little known V-2 fact is that after the more deadly attacks, British intelligence leaked information that implied the rockets were over-shooting London by 20 to 30 miles. This “mis-information” appeared to work, and for the remainder of the war, the V-2 attacks started to land on less populated areas of Kent. The final V-2 rockets of the war were launched on March 27th, 1945 resulting in the death of Mrs. Ivy Millichamp, 34, in her home located at: Kynaston Road, Orpington in Kent. The attacks on Antwerp, Belgium also resulted in numerous deaths, 1736 dead, 4,500 injured. There were a large number of buildings in the city damaged or destroyed by the V-2 attacks and the city was directly hit by 590 V-2’s. The largest loss of life attributed to V-2 attacks was when the roof of a crowded cinema was struck by the missile. This attack resulted in 567 dead and 291 injured. “Chute Saves Rockets Secrets” , September 1947, Popular Science article on US use of V-2 for scientific research, last Accessed April 7th, 2013. 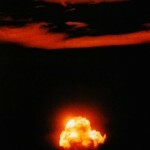 FlyingBombsandRockets.com, last accessed April 7th, 2013. History of Peenemünde and the discovery of the German missile development by the Allies, GlobalSecurity.org, last accessed April 6th, 2013. PBS: The hunt for Nazi scientists, last accessed April 7th, 2013. V2 Heavy Site Imagery – National Collection of Aerial Photography , last accessed April 7th, 2013. V2Rocket.com, V2 Rocket Timeline and other material related to the V-2, last accessed April 7th, 2013. World War 2, or WW II, was the largest war in modern history that lasted from 1939 to 1945. The conflict spanned across the world and included the majority of the world’s countries that split into two military alliances, the Axis and the Allies. More than 100 million military personnel saw action and major events of the war included the Holocaust, the only use of nuclear weapons in war, and was the deadliest conflict in recorded human history. World War 2 facts is published to help us remember what occurred during this war as our war veterans fade into memory. To get started learning more about the war, we recommend that you read or scan the World War 2 Battles or World War 2 Timeline articles which link to more detail on major events that occurred during WW2. Most people don't know that the Japanese submarine I-22 would shell Johnston Island on this date destroying a large oil tank. Also that I-1 would shell Maui on this date after the attack on Pearl Harbor. During British Operation Compass, Italian forces were driven out of Egypt.